Born in London in the late 40's, leaving school as soon as he could aged 13. Bob went on to do any job he could find including two paper rounds, helping on Milk rounds, Saturdays in a Greengrocers and Butchers shop. First married at 19 he became the youngest Rota/foreman in a Milk yard, and was a Milkman on and off for 27 years. Bob also had his own window cleaning business and a Cafe with his 2nd Wife in the 80's. 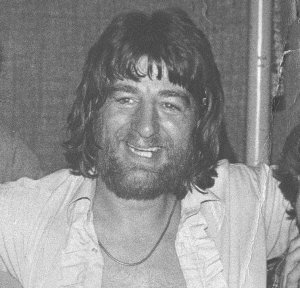 During the 70's and 80's at the same time as being a Milkman, he ran Music venues such as the infamous 'Cellar Bar' at the Bull and Bush in Richmond, 'Jesters' at Kingston, was the entertainments Manager at 'The Bull' at Sheen, returning to the 'Bull and Bush' then moving with the management to 'The Brown Bear' and later went back to 'The Bull' . He then became involved in organizing security at 'Redline Rock Promotions' (Mr Nick London), the "Clarendon' at Hammersmith, 'Sunset Club' Northend Road, The 'Red Lion' Brentford, the 'John Bull' Chiswick, and the 'Black Horse' at Richmond. Becoming fed up with standing outside clubs in the cold, and 72 hour weekends whilst still on the Milk round, he retired from Music Venues. Bob had already decided to retire at age 50, and now disillusioned with the UK he finally pulled the pin on both the Milk round and Security/Club work. Bob retired to France in 2002 at 52, to Fish for Carp, ride his bikes and enjoy a less hectic way of life. 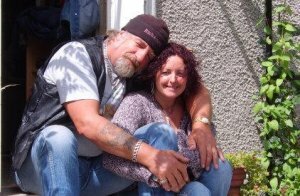 In 2004 he met Jan, also English, who owns and rides bikes herself and lived only 10 miles away from Bob. They now live together at St Dizier Leyrenne. Bob has led an interesting and varied life, so you will find he is quite a "character" ! Bob has fished for Carp for over 30 years throughout France, Holland and the UK. He first developed his passion for Carp angling when he met Richie Macdonald, then a famous UK carp angler during the 70's. After the notorious trip to Lake Cassien in France in 1985 with Richie, where Johnny Allen caught the big 200lb catfish, Bob fished for Carp in France extensively. Later on, a friend of Bob's, Rod Hutchinson, introduced him to the seclusion and joy of catching unknown fish on the scenic River Lot in Southern France, this was long before the River Lot became as popular as it is today. 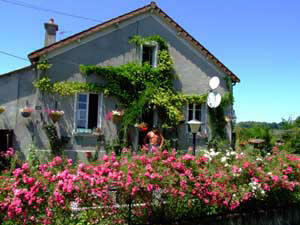 It was there that the idea came to Bob that one day, he would like his own property in France. Bobs most memorable Fishing trips have been to Cassien (3 times), St Croix, Salogou and the river Lot (often), where he fished with Mick Hall and Didier Coton. At the Twente canal at Hengelo in Holland he caught a 31lb Common, on a trip with Big John Bevin & Stevie Kerr. His final decision to move from the UK was during one stint as a lake bailiff for an acquaintance in Kent, England, where he witnessed for two whole days and nights, one fisherman bivvied up behind another, who was already fishing, awaiting his turn for the swim! After having seen this, he realized England was sadly no longer the anglers paradise it had been. Bob quickly developed a keen interest in motorcycles at the age of 14 helped along by his own fathers passion for two wheels. In the 1960's Bob started off with Ariel 'Arrows", and cleaned the Bikes at 'Monty and Wards' Twickenham. He then moved onto 650 BSA's, dabbled with Truimphs until 1972 when he bought a 750 Trident, blew it up at the 'Santa Pod' strip. He met up with Tom Quinn from 'Daytona Motorcycles' who turned Bob onto Kawasakis which he took Drag racing. He went through a number of 900's 1000's and 1300's whilst all this time he tuned and built bikes. In 1977 he bought one of only 3 made of 'Jubilee' Z1000's, the engine built by Pops Yoshimura in California, assembled by 'Godfreys' of Cheam. May 27th 1978 saw Bob in Hospital for nearly 5 weeks after hitting a roundabout at a speed in excess of 100mph. He sustained 14 Fractures to his face, both collar bones, left shoulder, right wrist, and left Knee. This accident made Bob decide to stop drinking altogether, and he still will not touch alcohol today. Throughout his biking history Bob was involved with various bike 'Clubs'. The '59' club and the infamous Richmond Club during the 70's to mention a few. 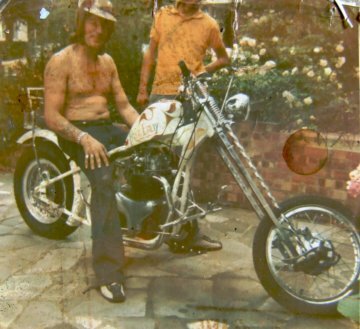 Over the years Bob worked for several motorcycle custom builders including Leon Wallace Customs eventually starting up his own business 'Builder's Of Bikes' (B.O.B's). Bob has a Hardy Mitre 'wondrex' Super float Rod for sale. Made in England it is an 11' split cane float rod which comes in 3 pieces. It can be converted to a 6'9" Ledger Rod with the second top piece. Reg No: 462199. Comes in its original Canvas case. Contact Bob, for photos or offers.